Citation: Sezer, Taner, and Türker Sezer. TS Wikipedia LDC2015T15. Web Download. Philadelphia: Linguistic Data Consortium, 2015. 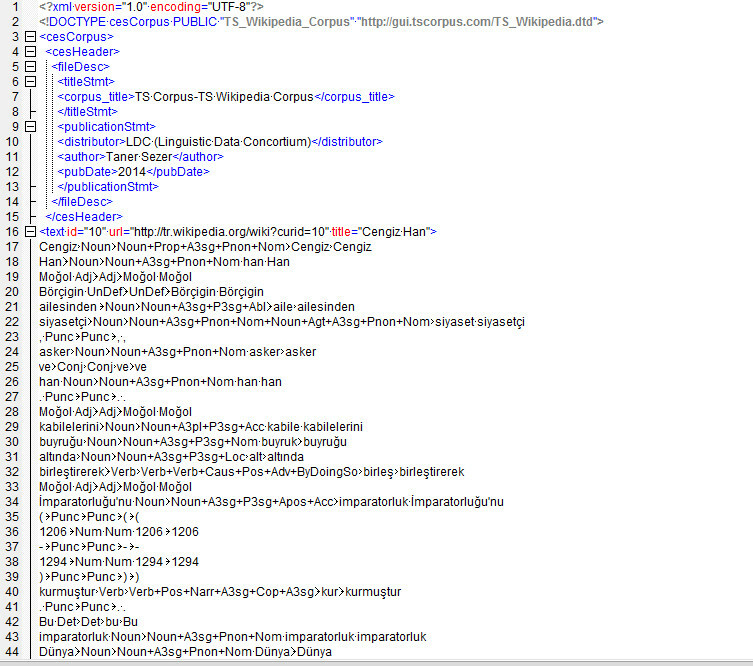 TS Wikipedia is a collection of approximately 1.6 million processed Turkish Wikipedia pages. The data is tokenized and includes part-of-speech tags, morphological analysis, lemmas, bi-grams and tri-grams. The data is in a word-per-line format with five tab-separated columns: token, part-of-speech tag, morphological analysis, lemma and corrected token spelling if needed. All data is presented in UTF-8 XML files and was selected and filtered to reduce non-Turkish characters, mathematical formulas and non-Turkish entries.